Snips Media (http://sni.ps/) and Steelehouse Productions (http://steelehouse.com/) today announced a partnership, making it easier than ever for brands and advertisers to produce highly engaging virtual reality content and distribute it across all digital platforms including web, social media, mobile apps, email, and text messaging. The partnership combines Steelehouse Productions’ deep expertise in producing interactive, story-driven content through virtual reality with Snips’ influencer-driven VR360 advertising network, to seamlessly deliver VR360 display and video ads across any social media or digital platform. Together this move empowers brands to deliver a unified experience to all viewers, as evident in this VR360 video (http://sni.ps/vr360). Virtual Reality is expected to top $1 billion in sales this year, however until now, there has been no single platform to publish and monetize VR content across all digital channels, creating enormous challenges for brands and advertisers. Using Snips, brands can run VR360 advertisements behind any content allowing viewers to look around in 360 degrees as they explore an interactive image or watch a video. Snips is an influencer network which connects brands with audiences of social influencers to amplify the reach of marketing campaigns. With Snips, advertisers can work with influencers to promote branded content, run online contests and giveaways, or place advertisements behind the organic content they share on social to support a brand’s marketing goals. VR360 is an extension of the Snips Social Impact campaign platform (http://sni.ps/advertisers/social-impact). All Snips campaigns, including those with VR content, are completely performance-driven so advertisers only pay for quantifiable engagements by real people (and not based on number of followers), which means better ROIs for brands. Steelehouse is a creative-driven studio with nearly two decades of experience using animation and film to engage audiences and build brands. The studio’s client roster includes entertainment studios, advertising agencies and brands around the world including Hasbro, Wal-Mart and Remington. For more information, visit: http://sni.ps/. Founded in 2013, Snips is the only performance-driven influencer network that connects brands with audiences across all digital platforms—social media, web, email, mobile apps, text messages. More than 10,000 influencers and brands rely on Snips’ network to create monetization opportunities and drive audience engagement. For more information visit http://sni.ps/. 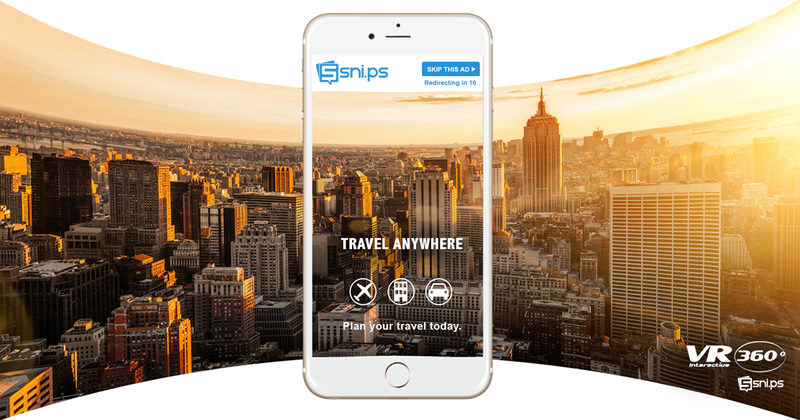 Publish VR content across every channel with Snips VR360Snips VR360 makes it easier than ever for brands and advertisers to distribute VR content across all digital platforms including web, social media, mobile apps, email, and text messaging.